When we decided to take a last-minute trip to Portland last weekend, we immediately checked the “Best Of” lists to see what Lobster Roll joints right in downtown Portland we may have missed. On most of our lobster roll trips, we used Portland as a base camp for venturing to points north (although, Portland has some absolutely great restaurants in its own right). This time, since we were driving through a blizzard, and wanted to stay close to town. 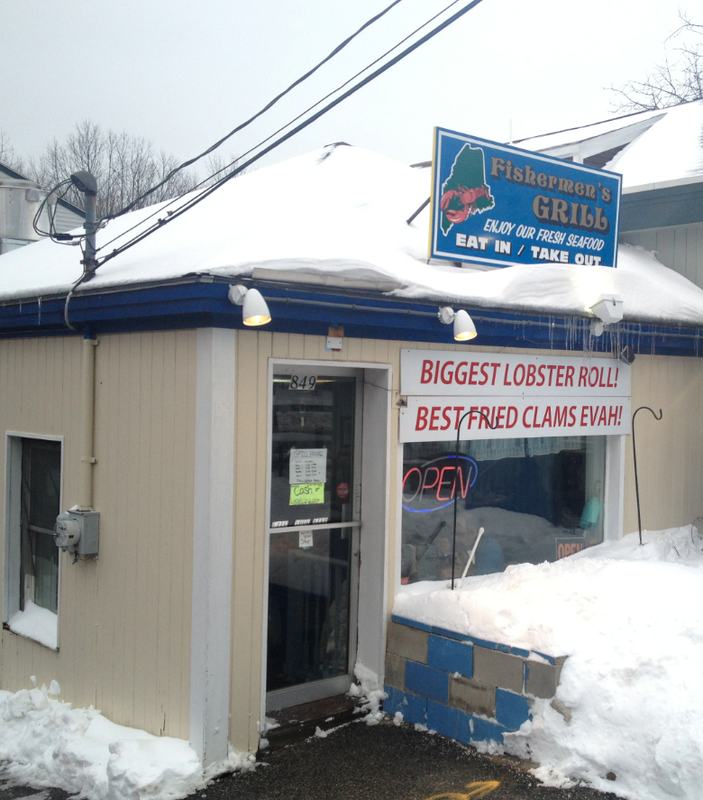 Also, we reached out to our lobster pal, Lobster Gal, who echoed several of lists when she recommended Fishermen’s Grill. We loved the look of this place right away. The small shack was already hopping when we arrived and we wondered if we’d be eating standing up, but our friend Liz scrounged up a table and some seats and, after ordering, we settled in. We had to wait quite awhile for these made-to-order rolls, and we watched the very proud owner, Tom, crafting these rolls in his small galley kitchen. 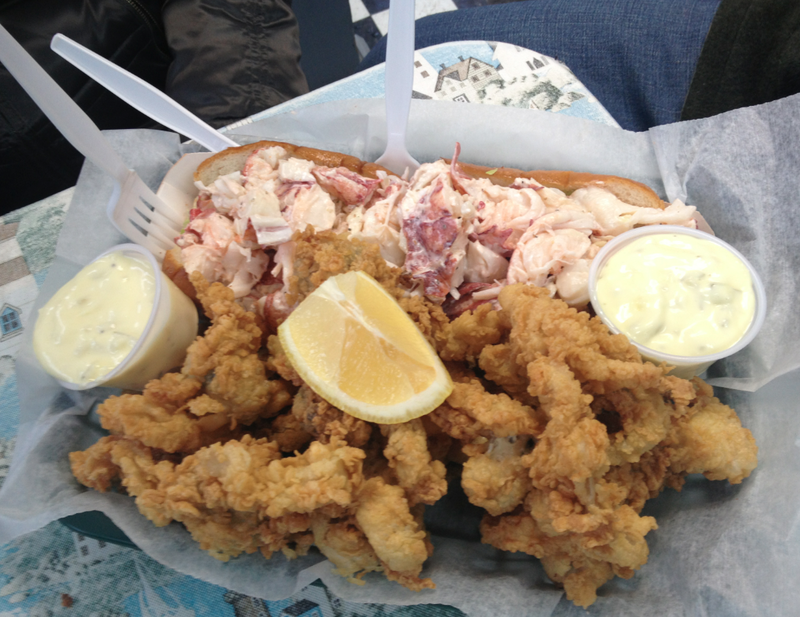 Our friends, Liz and Larry, ordered a special 2-person lobster roll that came with a side of fried clams, while we ordered traditional “Classic” rolls. Liz & Larry’s Two-Man Roll! Let’s just get to the point. These rolls were fantastic! The lobster meat was about as fresh as you can get, which makes sense since Tom cooks all lobsters to order. Just to reiterate, you might find rolls you like better, but you’ll never find better classic lobster roll! The bread, a traditional New England split top hotdog roll was grilled to buttery perfection. A bit of lettuce added a crispy crunch and, as we suspected (and Tom confirmed) they use Hellmann’s mayonnaise – ‘There is no other mayonnaise,” Tom responded when asked. 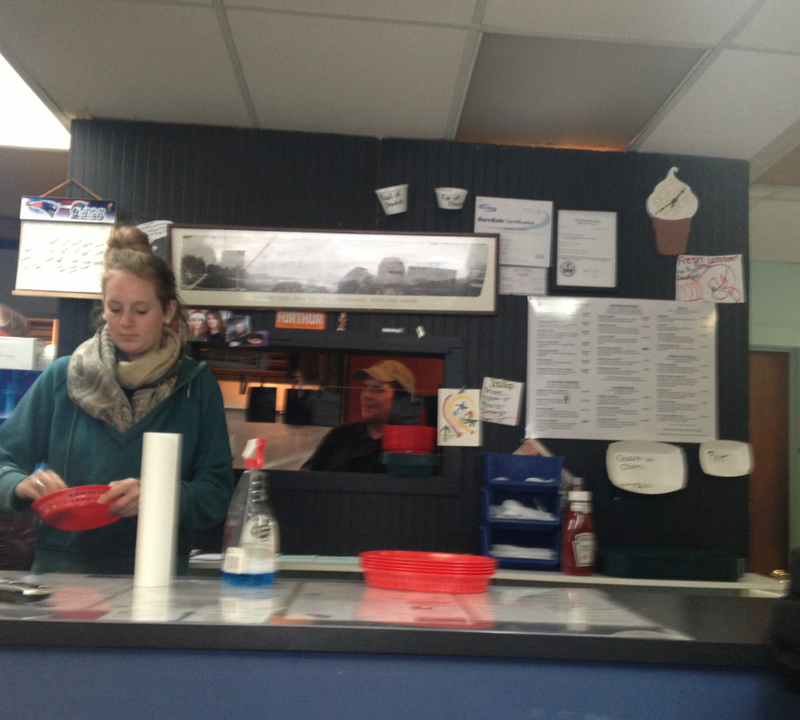 Liz and Larry’s 2-man roll was monstrous, and their side of fried clams were some of the best we’ve ever had. Our traditional rolls were in rarefied air – indeed, you’ll be hard pressed to find a better “classic” roll anywhere. Fishermen’s Grill was a great value, too, with a ton of lobster meat for a very reasonable price (something like $18 per). One of the very best “classic” lobster rolls you will ever find! 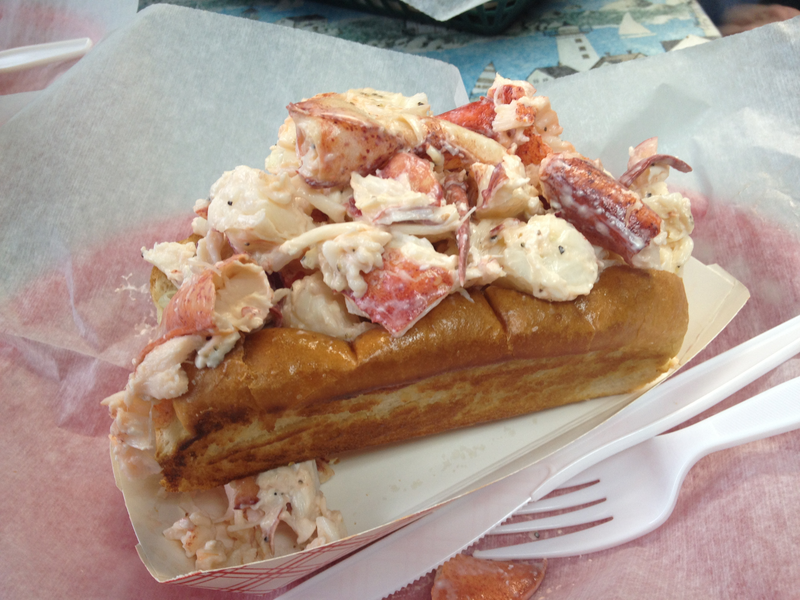 The Lobster Roll Chronicles 2012 Year In Review!